who could share a lifetime with you. But an unexpected circumstance caused an untimely end. the harder the relationship to survive. It's better to part ways than be together miserable. 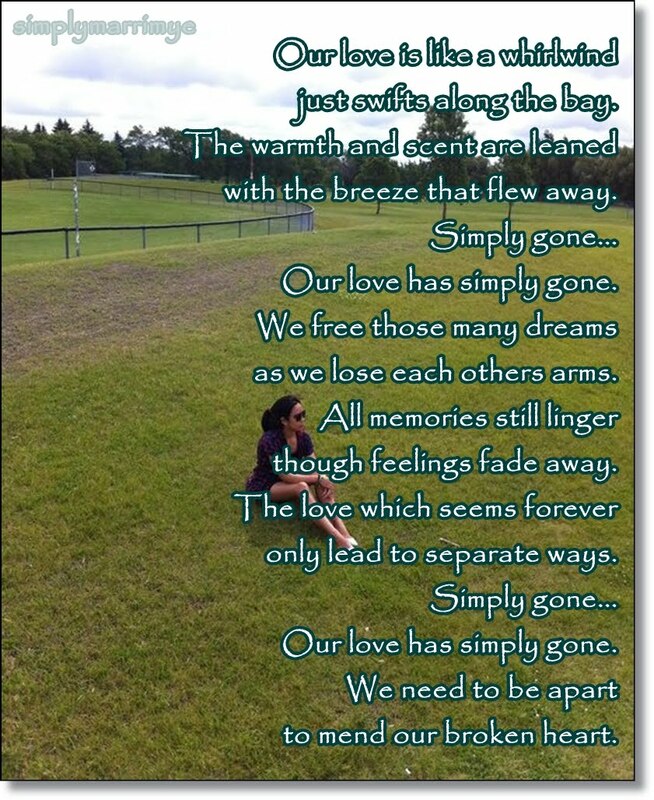 Such a nicely made poem but with a very sad ending. Well, maybe in some cases, being away is a way to grow and who knows it might be the growth we need to rediscover love once again. Sad ending... that's true and the girl in this picture... she's the inspiration. she had two kids and living in Canada now. She's survived being a single parent. LOVE isn't always a bed of roses... there are thorns that hurt. Sometimes, it's better to let go. Actually, I dedicate this poem to those who love so much and can hardly let go... but the girl in the picture sacrificed her love for the future of her kids. I'm sure, LOVE will eventually find her. I'm sorry to make you feel unhappy with this poem. LIFE and LOVE can give us pain but the positive side of letting go is... moving on and standing up for every fall. wow! you're so romantic. I love the poem's flow. Heartfelt one kahit na sad ang ending. When a person is in loved... sentiments truly rule the heart. What can i say? That's a straight from the heart poem of someone who used to love. The truth is... we all felt this lonesome emotion. awww, sad to hear that you need to break apart. hope you'll find another lover again. Letting someone free is not the end of the world but a best time to start anew. 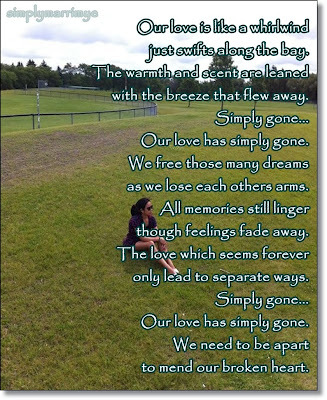 Why is it that we cannot do anything when love is simply gone? The more we try to hold on to it, the more it is forced out of our hands. There are things that are not meant to be, Ms Teresa. But, there are things that we deserve and we just have to be patient... it will surely come in HIS time. Certainly... someone more deserving to love. Lovestruck brings forth powerful eloquence. Wow!!! So deep... LOVE and its mysterious ways truly make someone very poetic and creative. Aww. This reminds me of a song, "I'd Rather Leave While I am in Love". I am not so familiar of the song lyrics but yeah... it's better to leave a relationship bound to break if there's still respect left rather than everything is gone and only hatred remains. I shouldn't have read this on a Sunday night :( Still, a wise runner once told me, "if there's an uphill, there's a downhill". Sometimes letting go is the best thing to do. It may cause a lot of pain but as the song goes, "there's a rainbow always after the rain"
Sad ending .A love thta fades away.I hope they find time to love each other again or find a happy life separately. To me it tells about a love between two people that simply went away and they had to separate ways.. not because there's a third party or any other issue. Poem that makes someone's heart twitch a bit. Nicely done but message is kinda sad. seems that the poem is reaaly personal and based on your experience... time will heal and mend the hurting ... scars are left to remind of the lessons we learned from it . The place looks familiar but I can't remember where I've seen it? Where did you take this picture? It just reminded me of Arvil Lavinge' song "Happy Ending"